The Latitude Margaritaville Daytona Beach, Florida, sales center is now open! The Margaritaville sales center is open for preview tours Monday through Saturday from 9 a.m. – 5 p.m. and Sunday from 11 a.m. – 5 p.m., providing those interested a firsthand glimpse of the new active adult destination. Sales for homes will officially open on Monday, November 13th at 9 a.m., with the first deposits accepted. Latitude Margaritaville Daytona Beach will include 3,000 homes with future proposed expansion including up to a total of 6,900 homes. The initial sales launch of approximately 300 homes is being released on November 13th. Due to a limited number of homesites in the first release, sales will be available in person on a first come, first served basis. Home designs and floor plans include villas and single-family homes ranging from 1,503 to 2,564 square feet under air, with prices starting in the low $200’s. Model homes are currently under construction with a total of nine furnished models, including four villas and five single-family homes, projected to open early 2018. Latitude Margaritaville, with its authentic “no worries” tropical vibe, will offer amenities that are on par with the world’s finest luxury resorts. Walkable neighborhoods and golf cart friendly streets will provide residents with easy access to the community’s many amenities, signature Margaritaville restaurant concepts, and shopping offerings. Residents will also have their own private Beach Club on the Atlantic Ocean with breathtaking views and beachfront amenities. A free shuttle service will be available to transport homeowners from their community to the Beach Club. New amenity details released today include a lively downtown featuring a state-of-the-art Fins Up! Fitness Center with aerobics studio, indoor lap pool, spa, group fitness classes, and full range of wellness services and community programs offered by the community’s wellness partner, Halifax Health. For outdoor fitness, fun and relaxation, residents will enjoy the Paradise Pool with beach entry, cabanas and tiki huts as well as tennis, pickleball, bocce ball courts and a Barkaritaville dog park. At the Workin’ N’ Playin’ Center, arts, craft and other programs will be offered – including a Coconut Telegraph Business Center, The Hanger workshop where residents can tune up their golf cart and even a Barkaritaville Pet Spa. Music will play an important part in the community, and residents will enjoy live entertainment under the bandshell in the Latitude Town Square. Additional amenities for dining and recreation include a Latitude Bar & Chill Restaurant, Changes in Attitude poolside bar and Last Mango Theater for dances and banquets. A 200,000-square-foot neighborhood retail center will include a grocery store and more. In February, Margaritaville Holdings and Minto Communities announced their partnership to develop Latitude Margaritaville active adult communities in some of the nation’s most popular destinations. Designed specifically for those 55-and-better who are seeking a uniquely fun and relaxed lifestyle experience, Latitude Margaritaville Daytona Beach is the first to open. 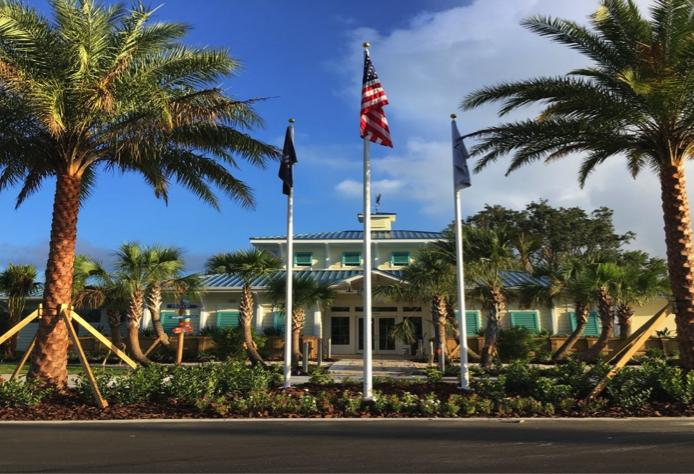 A second location is planned for Hilton Head, South Carolina, with its sales center opening date slated for early 2018. Click here for more information on Latitude Margaritaville and to sign up to receive regular development updates.